The Countdown to Christmas is on. - Dad Don't Lie - a Dad blog out of Halifax taking an honest look at the journey through parenthood. It's time to start counting down the days. The countdown until Christmas is officially on. As a toddler starting his second Christmas season, my son is ready. We put decorations up around the house, broke out the Christmas lights and my wife already had the Christmas music channel on full blast this weekend. As a new parent, I have a new found appreciation for the Christmas season, experiencing it all through my 17-month-old. The Toys - Since entering my thirties, my parents get me a standard Christmas gift each year: socks, underwear, laundry detergent and toilet paper. Pretty boring. It's not that exciting to be an adult. Now that there's a toddler in the house, that means I can shop for toys. I already have a great time playing with his Thomas the Tank Engine train table and shooting hoops on his mini basketball net. Now, I can shop for more toys for my son that we "both"can enjoy together. Christmas Movies - Think of all those classic holiday movies you used to watch each year as a child and then you probably stopped watching them when you were 12 because you were too cool by that point. With a child, you can watch those classic movies like Home Alone, a Christmas Story, National Lampoon's Christmas Vacation and Gremlins all over again (Well, my toddler probably isn't ready for Gremlins yet). Getting Up Early - I've never been a morning person. I used to love sleeping in every Saturday until 11 am-noon and growing up, we never got up early for Christmas morning once we were all old enough. But now that I have a son that wakes up at 6 AM every morning of the week, I'm actually excited to watch him get up bright and early, come down the stairs on Christmas morning to see the gifts under the tree. Visiting Santa - I don't really remember the visits with Santa as a kid but I do remember my Dad dressing up as Santa on Christmas morning in a really cheap plastic Santa suit when I was younger. I look back at the pictures now and I wonder "how the heck did I never think he was my Dad?" 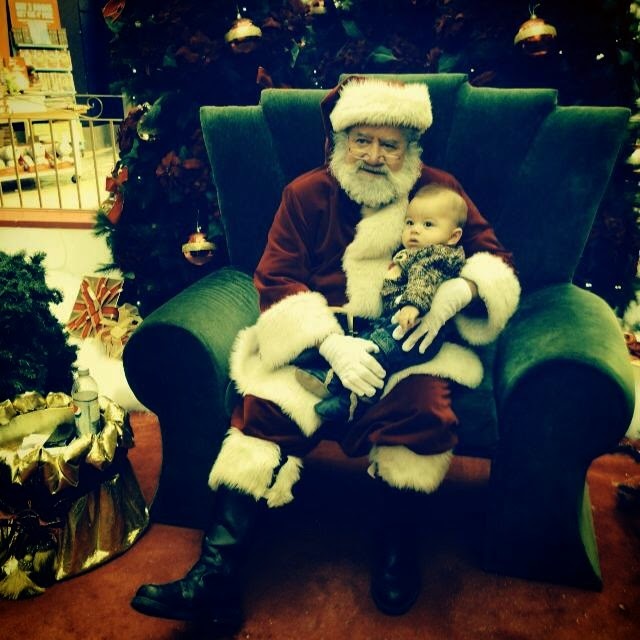 We took my son to visit Santa last year but he was only six months old at the time and it was more for a photo opportunity. Now, my son is already familiar with Santa from books and our Christmas decorations, so now I'm kind of interested to see if he'll be "star struck" this time around. Christmas Carols - I don't know what it is but my son has a Rudolph the Red Nose Reindeer book that also plays Christmas music and he is now obsessed with the Rudolph song, Jingle Bells and Frosty the Snowman. He runs around clapping his hands with the biggest smile on his face when someone starts singing along with the music. Then you put a tambourine in his hands and this toddler could put on his own musical performance. The next few weeks will be a bit hectic and stressful for most, but for all you new parents with young kids: relax and enjoy this time when your children are experiencing this holiday season for the few times of their lives.